Thanks to St-Martins & Zeitghost Media I have one (1) copy of Retribution by Sherrilyn Kenyon to offer to one of you! To enter, leave a comment letting me know if you’ve read the previous books in the series. You can earn one (1) extra entry to spreading the word. Please leave a second comment with your link. I haven't read the books yet, but I do have Night Pleasures loaded on my Kindle to start tonight. I've read some of them. The last one I read was Acheron and it was amazing! I have not read the othres in the series yet. This is one of those series that I have been wanting to get into. I haven't had a chance to read this series yet. Might have one of the books in my TBR pile. But I've read a lot of the Dark Hunters. I'm a huge fan. I've been lucky enough to meet SK several times at NYCC and SDCC. I love this series! Please include me! I am a couple of books behind but I love this series and am working on getting caught up on them!! Please enter me to win. I've read all the Dark-hunter books and loved them. I have read all of Sherrilyn's other Dark-Hunter books and loved them. This is one of the very first paranormal series I read. I am in Dark-Hunter withdrawl and can't wait to read retribution. I ADORE this series and have read it from the very beginning. Such great characters! So looking forward to this release. I have quite a few books in the series on my TBR shelf, but I haven't had a chance to read them yet. I'm looking forward to getting started though. Oh yes I've read the other books in the Hunter series I even have some of them in audio! I love this series! I've read about half of the series, and am working my way through the ones I haven't read as I can get my hands on them. I just read No Mercy last week, and tonight I talked my sister into starting the series! I've read and loved all the previous Dark-hunter books. I have read every book in the Dark Hunter series at least twice. I adore every one of them. I've read most of the books and I'd love to read Sundown. I was hoping he'd get his own story since I first read of him. I love Sherrilyn's work! Her books are awesome! Ive been waiting impatiently to read this! lol Id love to win. I have read all of her books and i own them all. Thank you for the chance! *SQuee!!! * I loooove the trailer!!! I really cannot wait to read this one!!!! I have read most of the series and they are awesome--- Please enter me in the contest. I have read all of them I think. The last one was with Fang and the bears' daughter. If Acheron was after that, I read it too. I've read all the previous books in this series and they are still on my keeper shelf, i've loved all of them and am looking so forward to reading this one as well. I have not read the previous books, but I have read several of her others and loved them. I just finished reading Archeron, and I've got to say this is one of my favorite paranoral series. I only recently started the series and have read "Night Pleasures". I'm excited for what the series has in store for me. I've read the first one and the second one is in the mail as we speak. I really want to read all the way through to this one because so far I've really liked them! I've read about half and have most of the other have in my TBR pile. I tend to read 3 or 4 each time I do a Kenyon marathon. I have read all the books in the Dark Hunters series except for Retribution. This is one of my favorites series. I have my fingers crossed in hopes that Mrs Kenyon will write Savitar's book soon. He's my favorite character. I've been a member of the Dark Hunter cult ever since I found it. I've read everything Sherri; some books a few times. I love this series! I read the first few and loved them. I'd love to start again! I love this series. 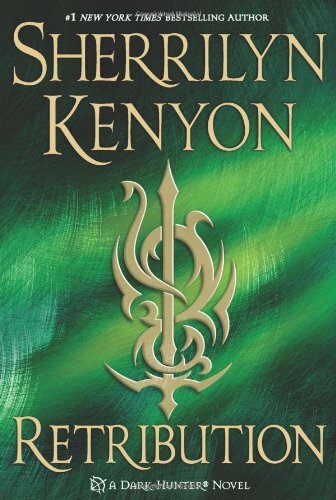 Sherrilyn Kenyon is one of my favorite authors. Thanks for the giveaway. I would love to read Retribution. I haven't had a chance to read books in this series yet but they are on my TBR and I plan to read it soon! I haven't read No Mercy yet. But have loved all the other Dark Hunter books. It's n amazing series. Thanks for the opportunity to win.